Robert Kiyosaki’s new book 8 Lessons in Leadership draws from his years at the Merchant Marine Academy at Kings Point and his service in the United Sates Marine Corps. With compelling stories and examples and a engaging way of comparing and contrasting two very different cultures and value systems, Robert shares the challenges he faced in transitioning to civilian life&hellipwhere chain of command and team-over-self—once so black and white—were muddy and distorted. “Permission to speak freely, sir?” Count on it. This is Robert Kiyosaki—and he does just that, in the forthright and no-nonsense style that readers have come to expect and appreciate. So who is Robert Kiyosaki? Robert T. Kiyosaki is best known as the author of Rich Dad Poor Dad. This is the #1 personal finance book of all time, which has challenged and changed the way tens of millions of people around the world think about money. Robert is an educational entrepreneur, co-creator of the CASHFLOW® board game, founder of the financial education-based Rich Dad Company and author of multiple New York Times Bestsellers including: Conspiracy of The Rich: The 8 New Rules of Money, and Unfair Advantage and his latest book 8 Lessons in Military Leadership for Entrepreneurs. Robert’s military training began in 1965 when he received Congressional nominations to the U.S. Naval Academy at Annapolis, Maryland and the U.S. Merchant Marine Academy at Kings Point, New York. In 1969, he graduated from Kings Point, and flew helicopter gunships in Vietnam for the U.S. Marine Corps. In 1974, he left the Marine Corps and began his career as an entrepreneur. 8 Lessons in Military Leadership includes perspective from other proud veterans, including Lieutenant General (Ret.) Jack Bergman of the United States Marine Corps, who wrote the Foreword, as well as Robb LeCount who served as an Aviation Machinist Mate in the United States Navy and is now an entrepreneur, small business owner, and serves as Director of Information Technology at The Rich Dad Company. 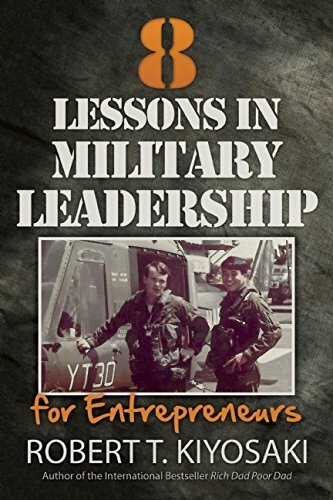 This book takes each lesson in military leadership and correlates it to how to start and lead a business. To get started, an individual must identify the players they need on their team, sell them into joining the team, and then build the culture for success that the entire team buys into. Just like the military. This book is written for anyone who is an entrepreneur, or dreams of becoming an entrepreneur one day. This book is also written for men and women who are serving— or who have served—in the armed services because they have already gone through a unique and rigorous educational process, a process that’s essential for all entrepreneurs. So I would highly recommend this book for anyone who is thinking of going the entrepreneurial way.